We have been making holiday dreams come true for over 45 years! Our family-run company is a name you can trust for quality and consistency. We have been awarded the Swiss Tourism Federation quality label and as the largest private provider of holiday properties in Switzerland, we guarantee you quality and service. From us you will receive comprehensive and professional service, all from a single source. We offer everything from equipping and maintaining the properties to classifying, monitoring and continuously optimizing them. For those who are interested in buying a property, we recommend our well qualified sister company Christoffel Bautreuhand AG. We are pleased to support those interested in acquiring a holiday property and help them expand the range of excellent accommodation options in Davos. We owe a huge vote of thanks to our property owners for their valuable and ongoing cooperation. Together we provide quality accommodation and value creation in our region. We aim to show our owners that making a profit by letting out their property is achievable without too much trouble or hard work on their part. If you are thinking about letting your apartment as a holiday rental, we will gladly assist you with valuable tips gleaned from many years of experience. You won’t need to do a thing – we take all the work off your hands from cleaning the apartment to producing Davos Klosters Cards for your guests. We also keep you updated at all times on bookings for your property. With our extensive range of around 250 apartments we are sure to have the perfect one for an unforgettable holiday experience. We are also available to assist you around the clock, so we can offer all the services you require. The success of every company depends on its employees. A good 40 people work for us behind the scenes, dealing with your requirements. We have also successfully helped 40 apprentices to start their careers and are very proud of this future-oriented achievement. Paula has been in the business for 44 years. Before that she was an air hostess with Swissair. With a mother from western Switzerland and a father from Davos, she is equally at home in both languages and cultures, and speaks German, French, English and Italian. She is the one who for over 40 years has ensured that guests feel comfortable in their holiday apartments. The name “Christoffel” is an obligation and a guarantee of ongoing quality. 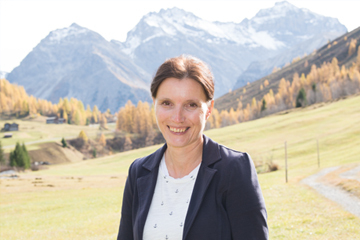 Born in Davos, Eva has joined the family company and wants to continue the Christoffel quality label. Even as a young girl she used to earn her pocket money by cleaning the holiday properties, so she knows a lot about the business. She obtained an MA/MBA in Communication, Tourism and Services from the University of St.Gallen. After that she returned to Graubünden, where she most recently managed a spa and wellness centre in Alvaneu-Bad with 60 employees. The young mother wants to bring fresh impetus to the company with her motto “Raising the bar”. Yvonne Drescher spent 21 years working for the holiday rental company Castellazzi in Davos. In 1999 she moved with the property portfolio to the company Guyan, then in 2008 she joined our team, again bringing the properties from Guyan. If you have any questions, please ask our very competent and experienced colleague, she will be pleased to help. As a native from Davos and mother of 2 teenies, Tanja Caspar supports us in a part-time job in our office. She acquired her commercial skills from 1991 to 1993 in our company. Best compliment for us is to be able to welcome former employees back to us, as is the case with Tanja. In her spare time, Tanja likes to be physically active in nature – be it by bike or cross-country skis. Holidays in nature and in caravans are also her hobbies. Tanja helps you to fulfill your holiday wishes and is looking forward to your call. Filip grew up here, then spent some time abroad before returning to Davos with his family. The only man on our team, Filip provides support and has recently begun his commercial training. His hobbies are swimming, cycling and gaming. Tamara decided to do her commercial training in tourism and will be happy to help you. With her southern charm she exudes holiday spirit, and her hobbies are that of a true Davos girl: sport of all kinds and music.